Most of the changes we have seen in the world in the last century has been around I.T. & the implementation of better & more efficient ways to do things. Rarely is it that one finds change that takes us back in time. Many may recall when you were young on the occasions of going to your grandparents` place that when you wanted fresh drinking water, you would get it from the rainwater tank at the back of the house. This was not because ordinary tap water wasn`t safe, but simply because the tank water tasted better than the town water. More importantly, it made good use of rain water that would otherwise wash down the gutters & on to the streets, & eventually back into various waterways. By the time we were old enough to ask questions as to why there was no longer tanks on houses, we may clearly recall being told that tank water wasn`t safe to drink because of the city pollution that would get into the water. We were only told this because the councils didnt want you to have a tank & so deprive them of revenue from town water rates! 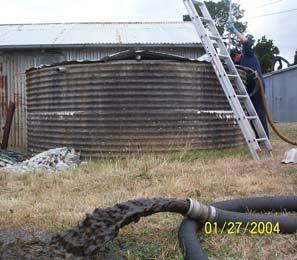 At long last Brisbane City Council is leading the way in water conservation with a new incentive-based plan thats been running since 1st July 2002 to get people to start installing rain water tanks once again onto their properties throughout the city. Melbourne & Sydney have followed suit through 2003 with the Victorian State Government paying more than $840,000 to 11,300 Victorians who have bought water saving devices under a rebate scheme. Rebates of $150 are offered for high-cost AAAA-rated washing machines and $100 for AAA-rated dishwashers. Since January 2003 more than 2700 country people have installed rain water tanks and almost $360,000 in $150 rebates has been paid to them. Rebate forms are available from retailers, water companies, the Dept. of Sustainability and Environment website; www.dse.vic.gov.au or by calling 136 186. Melbourne Channel 10 TV weatherman Mike Larkin has a forecast for all of us - there`s a strong likelihood of rainwater tanks being installed across the Melbourne metropolitan area. Mike should know. Not only is he reporting when it will rain, but as he already has his own water tank, he keenly appreciates the benefits that flow freely every time it does rain. Mike recommends rainwater tanks as an investment for every household. 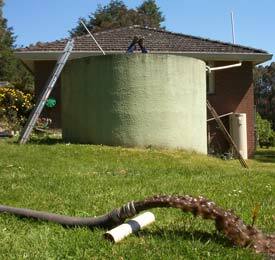 "Rainwater tanks are a great household investment for now and the future," the popular weatherman said. "And now is a good time to install a tank. If I can capture rainfall over the cooler months, I will be able to supplement my garden water supply next summer. This is particularly important given we are in our seventh consecutive year of drought." Mike believes that installing a rainwater tank is an important option to help manage water use, not just with water restrictions in force, but also over the long term. Another interesting development has been that the Victorian State Government proposes that all new houses include an additional $2000 cost to use less electricity and water. Under the Plumbing Regulations 2004, people buying new houses will be hit by two new regulations. First, they must install low-pressure water valves. They also have a choice of installing a 2000 gallon rainwater tank or a solar heating system. With Melbourne to have an extra million people over the next 25 years the proposed water storage tank for each new house will only improve our business. With this in mind the potential of owning a business that is solely based around keeping rain water tanks suitably clean so that people remain healthy is an extremely viable business proposition. Expressions of interest are sought from potential owner/operators who understand that good old-fashioned hard work and a real commitment to excellence in supplying a quality and reliable service to your rural clients is essential to achieve success in your new business. Upon being selected as a potential owner through a resume and interview process, you will be invited to spend time with other successful operators to see the business in practice where, if you fulfil all selection criteria, you will be offered a Licence Agreement which allows you to operate in your area. We are looking for a person who is capable of running a home based type of business who may, through their existing job, already have a computer data base of clients and is able to organise work on a day to day basis to satisfy these clients requests, by driving to their property and carrying out a specified task. We are offering a unique system of a rural nature that allows the owner / operator excellent returns, ongoing growth potential using proven equipment in a business package where we will supply all equipment necessary, initial training, use of intellectual property, advertising concepts, technical support, and financial advice. What is the Watertank Cleaning Company Selling? As per "Equipment to be supplied" in Licence Agreement. Proven equipment; Unique system; One of fee for all equipment. On site expertise and knowledge on the process. Company name, logo, equipment and process. Ie. Use of Trademarks and Confidential Information. Assistance with Flyers, Videos, Newspaper Ads, etc. Ongoing research and development improvements. Job knowledge; operation of cleaning system. Map usage; CFA regional maps for specific areas. Area & day designation for jobs & their sequence. Tank sizes & type for price quotations. Type of computer database for client information. Adherence to standards & requirements. Ability to on-sell licence agreement. Growth potential ongoing for owner/operator. Information on raising additional jobs.